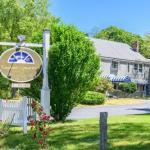 Nestled on six lush acres and located one mile from Cape Cod National Seashore and Coast Guard Beach the pet-friendly Captains Quarters Motel & Conference Center features free Wi-Fi sport courts and an outdoor seasonal pool as well as a conference room. The single-story Captains Quarters Motel & Conference Center's 75 rooms all feature free Wi-Fi mini-fridges coffeemakers hairdryers and cable TV. All rooms are non-smoking. Continental breakfast is available. The motel is a sports enthusiast's dream as it features an outdoor seasonal pool two tennis courts a beach volleyball court and basketball half court. Business travelers can gather in the on-site conference room. Pets are welcome in select rooms at an additional fee. Parking is free. The quiet Captains Quarters Motel & Conference Center in North Eastham sits one mile from Cape Cod National Seashore and Coast Guard Beach. The Atlantic Ocean and Nauset Marsh are two miles east of the motel while Cape Cod Bay is just west of the motel. Historical attractions within three miles of the hotel include the Eastham Windmill Eastham Historical Society and Three Sisters historic lighthouses. Logan International Airport is 97 miles northwest.